Anfield - LFChistory - Stats galore for Liverpool FC! Anfield was Everton’s home ground from 1884-1892, but disagreement with landlord John Houlding on the cost of rent, resulted in them moving out. The capacity was 20,000, but only 100 attended the first game of Houlding’s new club, Liverpool. Architect Archibald Leitch was hired to design the new Anfield in 1906. Its pride was the largest terrace in England built by Walton Breck Road, "Oakfield Road Embankment” or “Walton Breck Bank” among the names suggested. Ernest Edwards, the Sports editor of the Liverpool Post & Echo, later named it “Spion Kop” as a tribute to the many local men who died in a battle in the Boer war in South Africa on the 24th of January 1900 to take a hill called “Spioenkop” that literally means “Spy hill.” The Spion Kop had 100 concrete steps measuring 394 feet long, was 135 feet wide and standing 50 feet in height. It was effectively a huge cinder bank with a six feet wall at the back of it with six double gates to get in. Behind the terrace was a steep grass mound with 12 feet wide stairs leading to the road level. A new grandstand was erected by Lake Street, completed in the 1907-1908 season. The old one was re-erected at Kemlyn Road on the opposite side where it remained until its demolition in 1963. The terracing now joined the Anfield Road stand and the corners were rounded so any wasted space was used fully. The pitch was raised 5ft with a paddock all round. A week before the start of the 1906-1907 season, the Liverpool Echo said about the changed Anfield. “The ground has now been completely walled in with fancy brick setting, with large exit gates on the four sides as well as numerous entrances. Therefore, there will be no difficulty in either entering or leaving the enclosure. The directors’ aim has to been to provide as compact and comfortable a ground as possible in which every person, no matter what position he may visit, will have a full view of the game." You could see all over Liverpool from the top of the Kop but on the downside there was no shelter from the wind and being a Kopite was quite cold until a roof was built over the terrace in 1928. When Shankly took over in 1959, 29,000 spectators attended Anfield on average in the 2nd division. Shankly was a breath of fresh air and the crowds flocked to watch his team. The 1963 version of the Kemlyn Road stand was demolished to develop the Centenary stand with executive boxes, second tier and a cantilever roof. The Centenary was ready on 1st of September 1992, exactly 100 years after the first game was played at Anfield. The famous Kop terrace was changed into an all-seater stand in 1994, after the demands of the Taylor report following the Hillsborough tragedy. 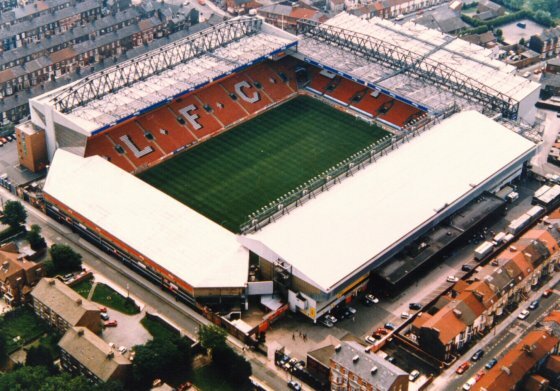 The latest development inside the ground was when an upper tier was built on the Anfield Road stand in 1998. First game at Anfield: 01.09.1892. Liverpool - Rotherham Town 7:1 Friendly. Attendance: 100. First competitive match at Anfield: 03.09.1892 Liverpool - Higher Walton 8:0 Lancashire-league. Attendance: 200. Liverpool did not lose a league match at Anfield seasons 1893/94, 1970/71, 1976/77, 1978/79, 1979/80, 1987/88 and 2008/09. Liverpool won all their home games in 1893/94. Liverpool's club record at Anfield are 85 home games unbeaten in all competitions. Liverpool did not lose at Anfield between 7th February 1978 to 31st January 1981. 85 games in total, 69 wins and 16 draws. 63 League games, 9 League Cup, 6 FA Cup, 6 European Cup and 1 Super Cup game. Liverpool scored 212 goals against 35.